How much for Jaw Surgery in TJ? 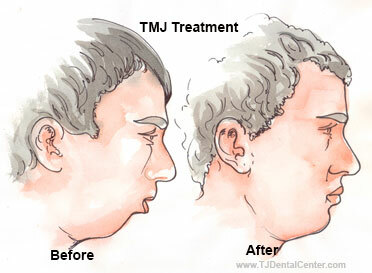 TJ Dental Center brings you affordable orthognathic Surgery in Tijuana, Mexico. 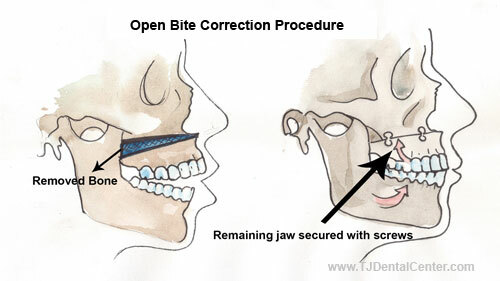 Also known as corrective jaw surgery and oral & maxillofacial surgery, it refers to a host of procedures correcting a bad bite as well as upper and lower jaw bone deformities. Our team of highly experienced oral and maxillofacial surgeons in Mexico offers solutions to all minor and major malocclusions. 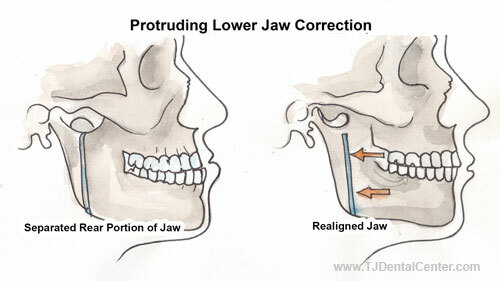 Watch this video in which our dental surgeon in Tijuana discusses jaw surgery. 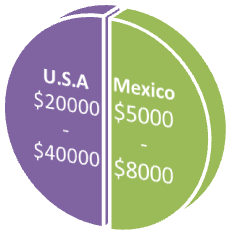 Why Tijuana for Oral & Maxillofacial Surgery? Just about 17 miles from San Diego, California, TJ can be easily reached from the United States. Click here for more information on how to reach Tijuana as well as the travel documents required. 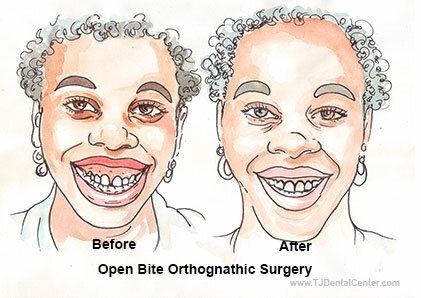 The objective of orthognathic surgery is to improve bite and its function. It can have a very positive effect on various aspects of life as many patients may also experience improvement in their appearance, breathing, and speech. The following figure is derived from a 2015 study by Goiato and colleagues which gives the mean value of satisfaction in relation to smell, speech, swallowing, chewing and breathing after orthognathic surgery. 2 The research study further states that "orthognathic surgery has been an effective treatment for dentofacial deformities, aesthetics and functional problems." 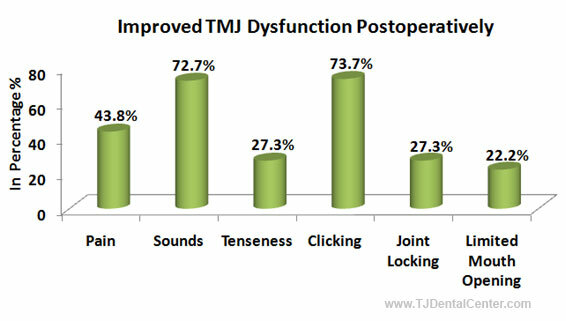 Here is another figure derived from a 2010 research study by Jean-Pascal Dujoncquoy and colleagues which shows the percentage of patients who had relief from TMJ symptoms after corrective jaw surgery3. 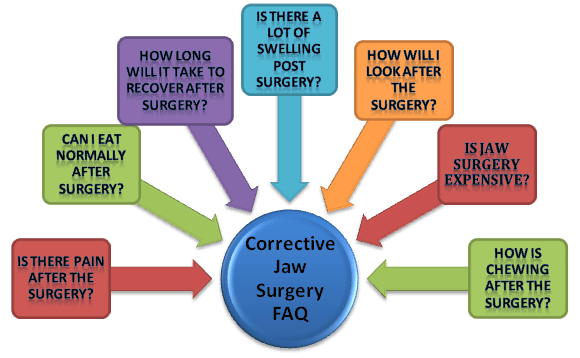 When can You have Corrective Jaw Surgery? The purpose of this study was to determine orthodontists’ perceptions of skeletal age limits on Orthopedic Therapy and Orthognathic Surgery. Earlier, both dental and skeletal malocclusions were managed with orthodontic treatment alone. Irrespective of the position of the jaws, braces were assigned to the teeth to align the dental arches for achieving the best possible results. However, the results were unpredictable and unstable and often times facial aesthetics were compromised. Usually an orthodontist aligns the teeth with braces before the surgery. The orthodontic treatment may last upto 6-12 months and regular orthodontist visits may be required. During this phase, extraction of one or more wisdom teeth may be done. 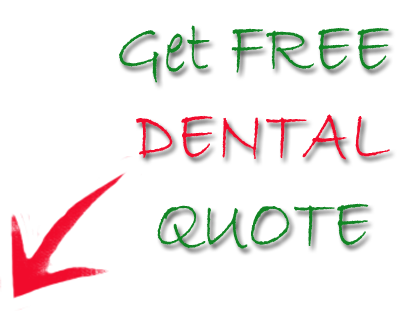 In case of cavities and periodontal (gum) disease, you’ll have to visit your dentist for treatment. For the jaw and teeth to work well it is important to align them. Braces make sure that the alignment of teeth with the jaws is achieved after surgery. The surgery is usually performed under general anesthesia and duration of the surgery varies from 45 minutes to few hours. Patients are taken to a recovery room after the surgery is over and kept under observation until the effects of the anesthesia have worn off. Depending on the procedure performed, patients can go home the same day of surgery or may be required to stay overnight at the clinic. 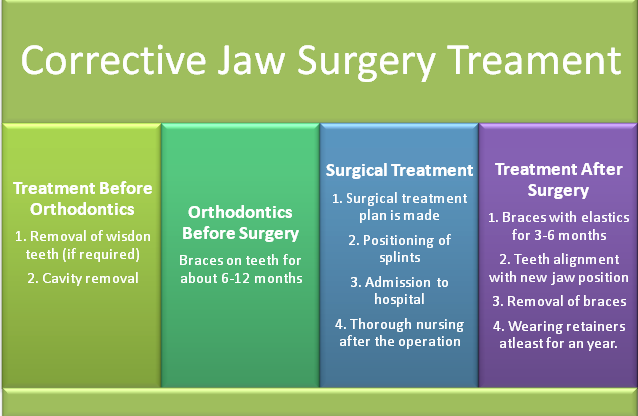 Jaw surgery may be performed on the upper jaw, lower jaw or both. 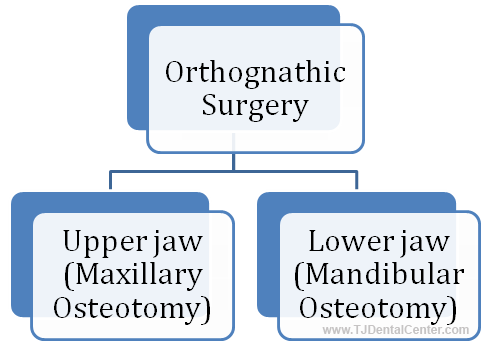 Maxillary Osteotomy is for patients with an upper jaw deformity or an open bite. In this surgery the surgeon cuts the bone above the teeth and below both the eye sockets in order to make the entire upper jaw, roof of your mouth and upper teeth to move together as one unit. The jaw is secured with titanium screws and plates that hold the bone in its new position. Over the time, these screws integrate into the bone structure and stay inside the mouth permanently. Mandibular Osteotomy benefits those who have a notably receded lower jaw. In this surgery, the incision is made behind the molars and lengthwise down the jawbone so the front of the jaw can move as one unit. As a result, the jaw slides smoothly to its new position. The jaw is stabilized using screws until the healing process is over. Numbness: The top lip may remain numb after the operation. This may take few weeks to disappear. Bleeding: Some bleeding is expected after the surgery but that’s normal and usually goes away in a week or so. Infection: The tiny screws in the mouth that hold the jaw together can sometimes become infected but it does not last long. Bite Adjustment: Usually an adjustment in the orthodontic braces takes care of the new bite. Rarely any other surgery or procedure is required. Nerve Injury: Nerve injury is rare but it is common to have temporary loss of sensation in the lips. Do not blow your nose or sneeze for the first 2-3 weeks especially if you had an upper jaw surgery instead use nasal decongestants. Surgical incisions are usually in the mouth and do not show up on the skin or neck. If due to some reasons you have had a bone graft then you should not take bath for 7-10 days after the surgery. You can take a sponge bath and be careful not to get the incision area wet. Care must be taken to avert infection in the incision area. Post-surgical swelling usually lasts 48 to 72 hours and then gradually decreases. Although some swelling will be there post-op but keep your head elevated while sleeping to reduce it. Apply ice pack for at least 30 minutes in an hour. Pain control medicines also help decrease the swelling. Do not indulge in physical activity of any sort or playing sport immediately after the surgery. Seek permission from your surgeon after few weeks of the surgery. Take fair amount of fluids to prevent dehydration. This can consist of fruit juices, milk or water. It will be tough initially because the mouth will not open fully but you can use a straw to drink. Avoid solid foods altogether for the first few weeks following the surgery. Q - Is there pain after the surgery? A - Like any other surgery some pain is expected. Usually pain disappears within a few weeks. Q - Can I eat normally after jaw surgery? 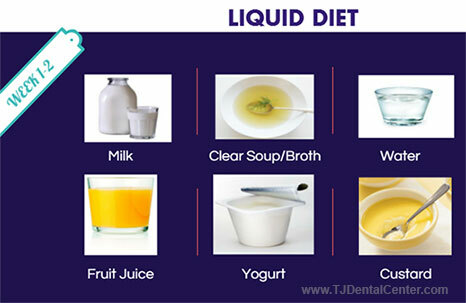 A - Diet plays an important role in jaw surgery and you will need extra calories and nutrition to recover well. First few weeks is liquid only diet. 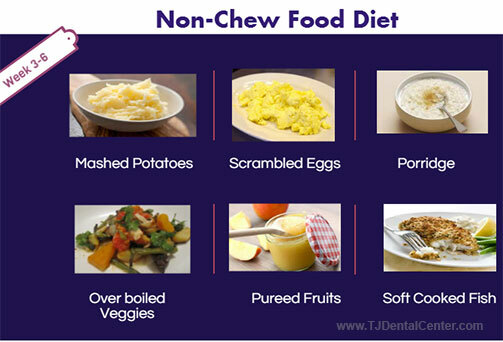 After 6-8 weeks you can progress to soft chew diet. Q - How long will it take to recover after the surgery? A - Most patients resume work within few weeks of the surgery. Sports and other physical activities are not recommended immediately after the surgery. Q - Is there a lot of swelling post surgery? A - Usually swelling and bruising resolve within 6-8 weeks of the surgery but it can take a little longer also. Ice packs and head elevation while sleeping help resolve the problem of swelling more quickly. Q - How will I look after the jaw surgery? A - The surgery aims to balance the framework of the face with teeth that can chew properly. Q - How is chewing after the surgery? A - It will take anywhere from 6 to 18 months of braces following your jaw surgery to correct your chewing/new bite. Q - How much time does the surgery take? A - It takes one to three hours depending on the type of surgery required. Q - How long do I have to wear braces? A - Pre-surgical braces vary from individual to individual. You may have to wear braces for 6-12 months depending on the type of surgery. Prior to the surgery, your dentist will inform you about the duration of your braces. Q - How can I get in touch with the Doctor after the surgery? Watch the full video on Orthognathic Surgery Follow-Up Routine here. Q - Is jaw surgery expensive? For more information, fill in the quote form on the right.